First, you will need the basics, like a desk or table, a comfortable chair, a decent reading lamp, and a computer with a word processing program. Make sure that you have enough space to work in, since you will be taking notes. Look for a cup to keep pencils and pens in, so you will not have to waste time looking for something to write with. Always keep a pencil sharpener and paper clips on your new desk, because you will use them daily when you work. Second, you will need to leave room for a filing cabinet or some file boxes, so you can keep track of what you are submitting and receiving. Pick out a special place to keep your references books, your important files, monthly earnings, and important tax information. As you pursue your freelance writing career, you will find that your career can stay on track…if you stay organized! Never keep all your files on the computer’s hard drive, unless you back up your information on a CD or floppy disk. Third, be sure to keep a dictionary and a reference set nearby, so you can look up any information that you may need. In addition, you will need to look for an internet company that can suits your individual needs and budget. Then, you can sign up and begin researching the internet or the “Information Highway” for facts to include in your article or story. Therefore, you will need to create a multi-purpose writing space, which is able to inspire you and handle your daily needs. Finally, you will need to establish a daily writing schedule, but you must pick a time that your creative muse will be readily available. Start, by setting some ground rules about you new writing space with your family and friends. Ask each member to refrain from disturbing you, during your official writing time, and turn your phone’s ringer off. Post your designated writing schedule on the refrigerator door or leave a note on the family message board. Choosing your own writing space, can be as simple as rearranging some furniture in your bedroom or in quiet space. However, if you have no extra space for setting up a small office, then you may consider remodeling an extra bathroom or adding a small room. Either way, you should choose a place that is away from all of the household distractions. Then, you can allow your creative juices flow, as you concentrate on creating a daily writing habit. Everyone will learn to respect your writing schedule and be supportive of your freelance career. However, there will be things that interfere with your writing schedule, but you try to rearrange you schedule for that day or week. This way, you will not lose precious time that is required to complete your writing projects. 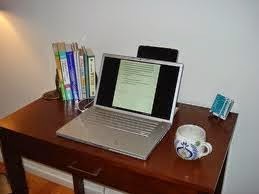 Furthermore, you can adjust your writing space as you see fit, once your career begins to grow. Previously Published on Yahoo Voices.